ENCINO, Calif. — Hello from the location of a commercial shoot, the result of which will dominate your TV sets while you watch football this fall. Bud Light invited The MMQB to go behind the scenes of its latest ad campaign, which got me thinking about how much beer and football are aligned on both Madison Avenue and whatever avenue you live on. 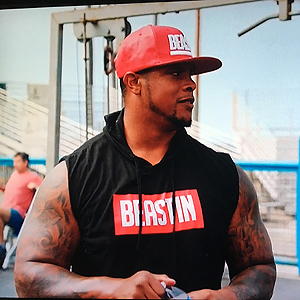 So below, I’ll tackle the intersection of pilsners and pigskin, and then take a look at the fashion choices on HBO’s “Hard Knocks,” a potential trend in dog ink and much more. 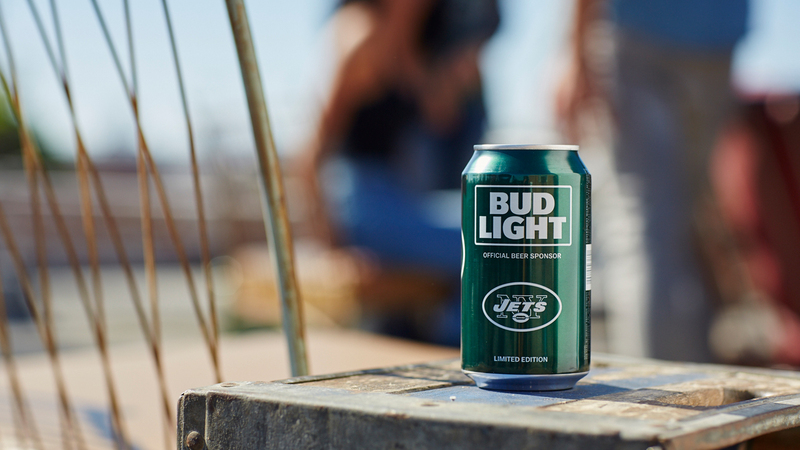 Last week, Bud Light grabbed some always coveted social media buzz with the release of 27 NFL team cans. The rush was on among fans to retweet and Instagram the new minimally designed cans, a practice that didn’t thrill everyone. Regardless, the event underscored something long known: Football fans love beer, and beer brands love football. • One of the five teams that won't have a Bud Light can, the Rams, might get one with another brand. 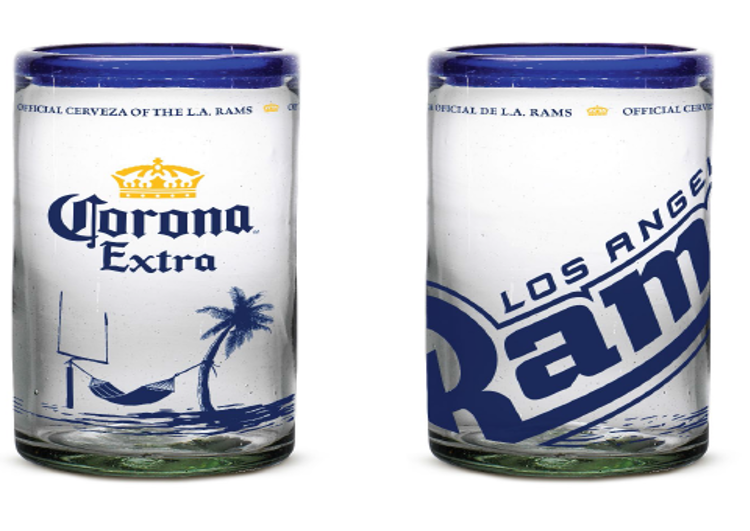 Earlier this week, Corona announced it will be the Official Cerveza of the Los Angeles Rams. 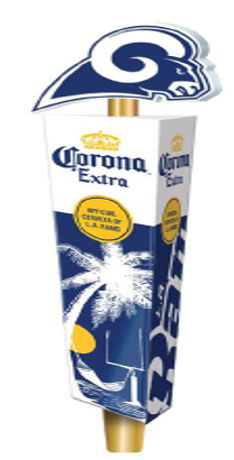 A Corona spokesperson told The MMQB that they were looking into brand packaging but didn’t have release dates or details yet. In the meantime, Corona will be available on draft at the Coliseum—a rare occurrence for the mostly collegiate venue the past few decades—with special tap handles featuring a 3D Ram. 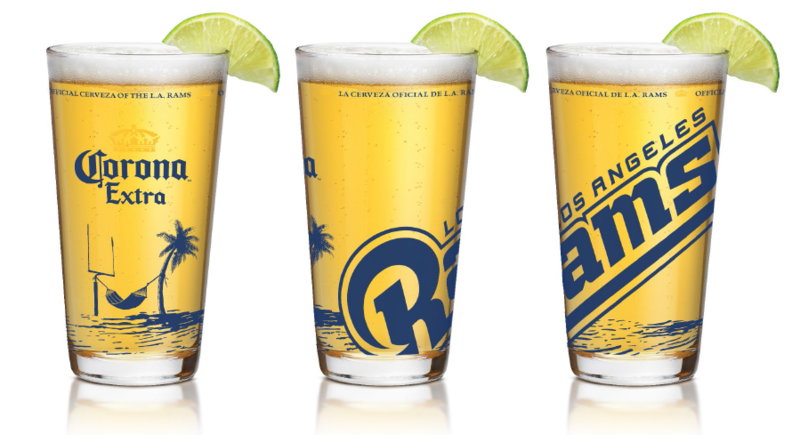 Later in the fall, several L.A.-area bars also will have the Rams/Corona tap handles and will use Rams/Corona-branded pint glasses and Mexican water glasses. • Another beer brand, Labatt Blue, is getting into the act of cans aimed at the tailgating demographic, as reader Brian W. of Buffalo pointed out to me. 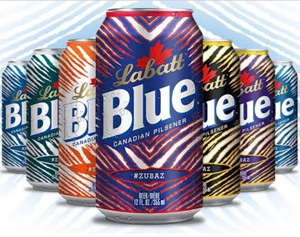 This week, Labatt began rolling out its Zubaz-branded cans, an ode to the lovably ugly early-90s pattern. While not officially associated with NFL teams, the color combos chosen—especially that red-and-blue beauty—will get a lot of play in NFL markets like Buffalo. I'm not sure if you’ve heard but Bills fans kinda enjoy their cold beverages. • Of course, the craft beer boom is capitalizing on football too. Bossman Peter King pointed out the other day that Titletown Brewing in Green Bay, which features a football in its logo, offers the cleverly titled Green 19 IPA, an ode to the signal Aaron Rodgers often hollers at the line of scrimmage. There’s also Pigskin Brewing Co. in Columbus, which offers Laces Out Hefewiezen and Kickoff Brown Ale, and dozens of others across the country. Craft brewers, if you’re fermenting football-related beers this fall, drop me a note. 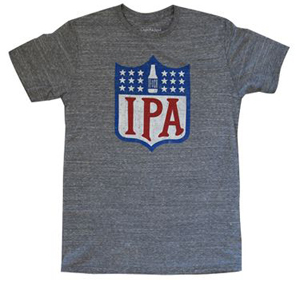 • On the apparel front, you certainly will come off very bro-like by combining your love of football and beer into a shirt. If you must, however, I recommend this shirt from Tankfarm & Co., a rising brand based in Seal Beach, Calif., just down the sand from me in Long Beach. I’ve got a couple tri-blend tees from Tankfarm and you’ll be happy with the quality. Some people look at the below picture and think, Jeff Fisher, Rams coach. Others look at it and might think, 8 and 8, or maybe even Sweet Stache, Dad. I look at it and think, Costa sunglasses. I’ve loved HBO’s “Hard Knocks” since 2007, when Herm Edwards welcomed his Chiefs players to camp with posters he colored by hand like an excited kindergarten teacher. When I watch the show, in addition to appreciating the insight gained from peeking behind the NFL curtain, I’ve always enjoyed seeing what brands players and coaches are repping while the cameras are rolling. Fisher has been known for his affinity for shades dating back to his Oilers days. 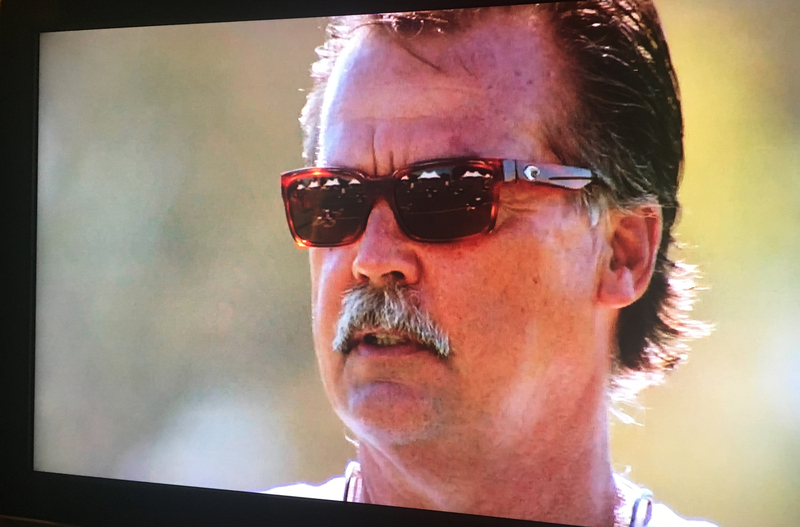 As the show revealed, Fisher packs plenty of sunglasses for camp and seems to favor Costa, which makes sense. Costa aligns itself closely with fishermen, and Mr. Montana Cabin certainly loves his trout. Kush flexed his way to immediate “Hard Knocks” stardom when he proudly showed off his impressive tank top collection. 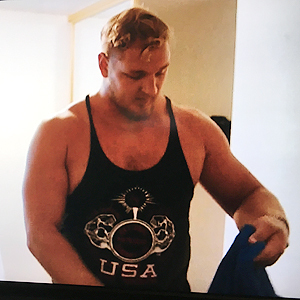 In perfect appropriateness, the tank Kush was wearing during the scene is a product from the National Physique Committee. Bro, you can’t make up this stuff. 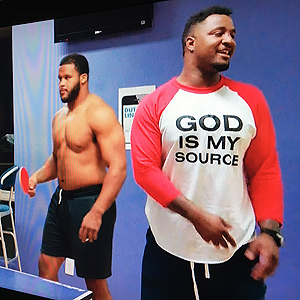 Sims wore this shirt while showing off some forgettable ping-pong skills, and ticking off shirtless teammate Aaron Donald in the process. The shirt is the product of a man named Kendale Lumpkins, who calls himself the Barbershop Preacher. 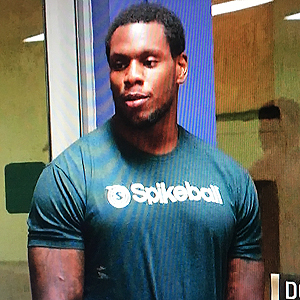 While observing the ping-pong match, Easley wore this shirt and it immediately caught my eye. I’ve previously written about Spikeball and am glad to see it make its way into the NFL community. Hoping we see a set make an appearance in future episodes. What else would a guy wear while doing a vanity workout at Venice’s famed Muscle Beach? He loses points for breaking the double-logo rule, though I’m sure the Anonymous Talents brand didn’t mind one bit. 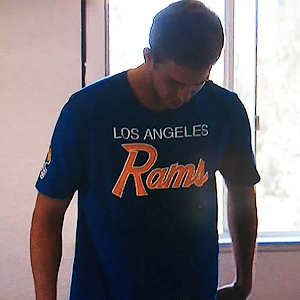 I liked most of the Nike team-issued gear that dominated the show, but this shirt Goff sported in one of the scenes stood out. I also picked it in the T-shirt article, and the reasoning remains: That old-school Dickerson/Everett recall is pretty cool. • The KCB Sports Marketing/Rosenhaus Sports team wanted to let us know that they also send these out to their 110 NFL clients, including Patriots TE Rob Gronkowski, Steelers WR Antonio Brown and Texans LB Brian Cushing. 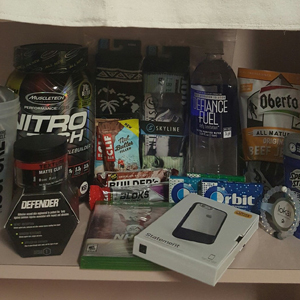 KCB/Rosenhaus calls it their Training Camp Survival Pack, and it includes such life-saving items as Skittles, Oberto Beef Jerky, an EA Sports video game and Speed Stick deodorant. • The players really do use the products they receive, much to the delight of the marketing agents. Remember how mom would beam when you liked a new food item she put in your lunch box? SAME. This is Sanders. She is a four-month-old Chinese Shar-Pei. And before you call PETA on Terry Hessler, 43, he would like you to know the “tattoo” is not real. “It’s called a pet stencil,” says the Denver-based commercial cleaning business owner. 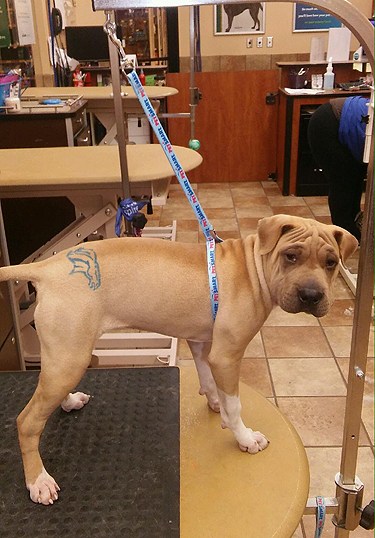 “The product is more or less a colored hairspray.” Hessler had the Broncos logo put on Sanders at his local PetSmart, where his son’s girlfriend is a groomer. Hessler reports the stencil stays on about a week or two, depending on how much the pooch rolls around and plays. Hessler has been a Broncos fan his entire life and says his favorite memory as a fan was the team’s first Super Bowl win following the 1997 season. 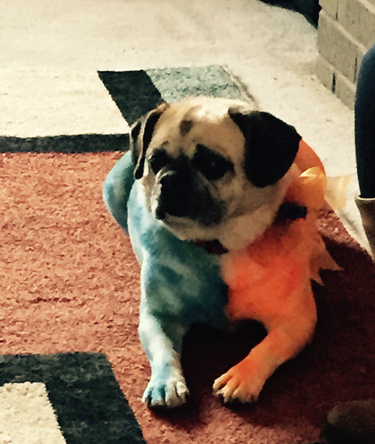 For Super Bowl 50, he had his other dog, a white Pug named Sassy, painted orange and blue. And to put one big Broncos bow on this tale, yes, Sanders is indeed named after Broncos WR Emmanuel Sanders. One of the more surprising items frequently spotted on players at camp? Bucket hats, says NFL Network’s Good Morning Football crew. They’re on the fence, and I am too, but if you must go Gilligan, here’s a good place to start ... Clayton Kershaw gave all the Rams some pretty awesome Welcome To L.A. gifts ... It kinda figures that the man with a clean-cut image hates messes ... First the tank tops, and now this picture. “Hard Knocks” producers, I think I speak for the rest of America when I say, We want more Kush.